April 15th will always be known as the day Major League Baseball pays its respects to a true legend in that of Jackie Robinson Jr.
We all know Jackie’s story. He broke the game’s color barrier back in 1947 as a member of the Brooklyn Dodgers. Robinson’s importance to baseball stretches far beyond the diamond. Over the past several years, MLB has decided to celebrate Robinson’s life and career by having all of its players wear his No. 42 jersey — a number that is retired by the league’s 30 teams. In his return to the lineup after missing the past three games to injury, MLB’s best player Mike Trout will return to the diamond on Monday. It’s just a coincidence that his return comes on Jackie Robinson Jr. Day. Prior to the start of Los Angeles’ game against the Rangers in Texas, Trout payed homage to Robinson. That’s a grand gesture from a great man right there. As appreciative as any current player in looking back to the past, Trout knows the significance that today brings. 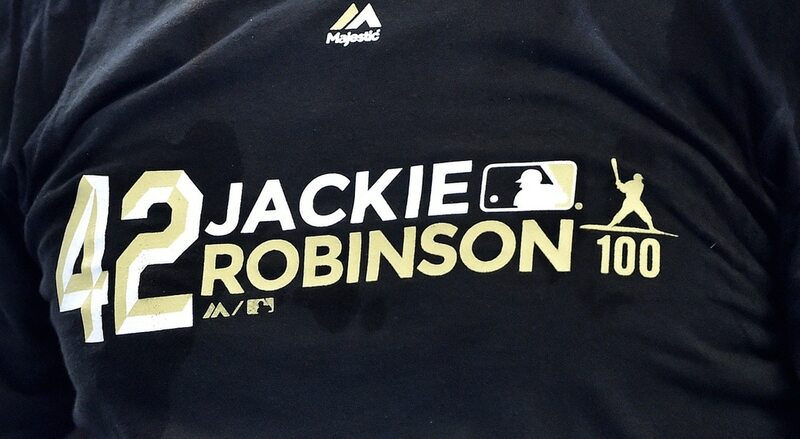 It’s also pretty awesome that he gets to return to the field on the same day that MLB is celebrating Mr. Robinson. We honestly wouldn’t be surprised if Trout honored the game’s most impactful player with a moon shot or two.